FOSHAN SHUNDE HUAJI INDUSTRIAL CO., LTD. This equipment is used to send the paste to the hopper of overlapping machine、three colors machine、roll-printer machine,and other feeding machine.it is suit to auto-sending on the same floor. 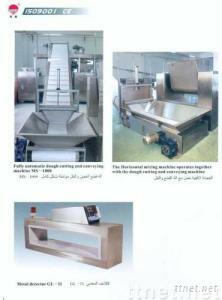 it cut dough into sheet pieces by air pressure and send it automatically.